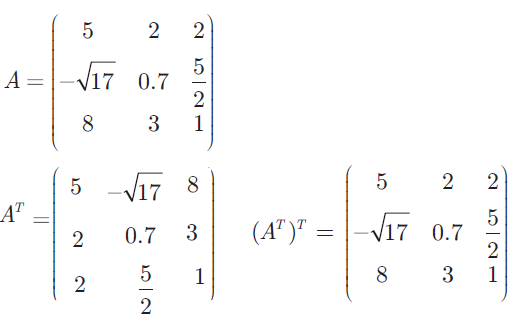 How to Find the Transpose of the Matrix ? Here we are going to see, how to find the transpose of the matrix. The matrix which is obtained by interchanging the elements in rows and columns of the given matrix A is called transpose of A and is denoted by AT (read as A transpose). 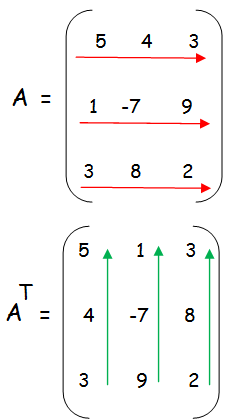 If order of A is m x n then order of AT is n x m . We note that (AT )T = A.
then find the transpose of a matrix. To find the transpose of the given matrix, we have to write the elements in the rows as columns and the elements in the columns as rows. then find the transpose of-A. 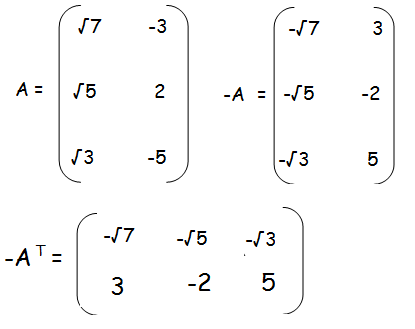 Since the order of matrices are same, corresponding terms will be equal. x = 2 and x = 4. After having gone through the stuff given above, we hope that the students would have understood, "How to Find the Transpose of the Matrix". Apart from the stuff given in this section "How to Find the Transpose of the Matrix", if you need any other stuff in math, please use our google custom search here.